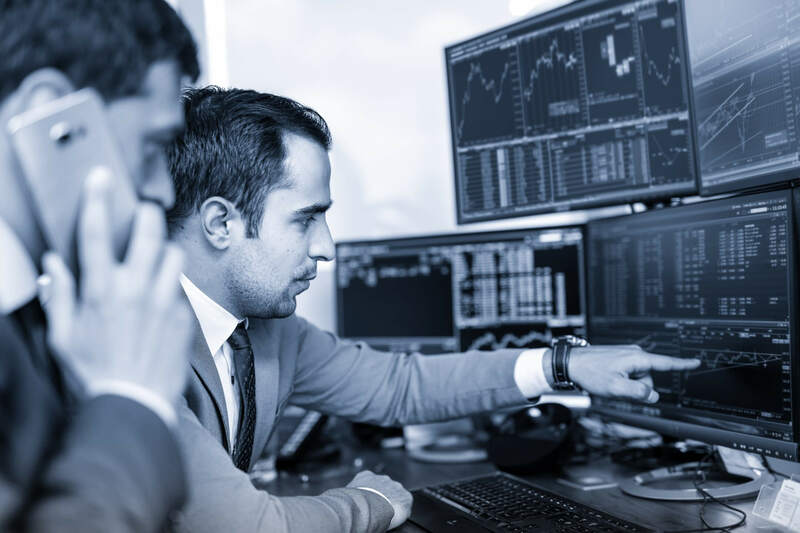 In order to trade currency pairs, you need a broker, who places the trades on the market for you, and the electronic forex trading platforms execute your trades and communicates them to the broker. There are two types of forex trading platforms: PC-based (usable on Macs some tablets as well), and smartphone-based applications. For PC, Mac or tablet-based trading, the forex market is dominated by MetaQuotes Corp., a Cyprus-based company. The MT4 and MT5 platforms are used by most professional traders and have been for the past ten years. These high-quality forex trading platforms do a lot more than just execute your trades. First, they list all the currency pairs available via your forex broker. Then, you can track currency pair prices via your MT platform. You can get charts with varying periodicity, meaning the same pair can be charted for 15-minute periods or three-day periods or for whatever time period you require. Most forex traders work at least partly with stochastic or technical indicators — MetaTrader 5 provides over 80 built-in technical indicators and analytical objects for the most detailed price analysis. You can also connect up with a forex trading signals service to receive them on the forex trading platform. For years, MT4 was the most popular forex trading platforms by far. MT5 is, however, taking some time to achieve the same level of popularity. So you will often find even professional forex traders still working on MT4. Dealbook360 also offers fully automated trading, which MT5 does not. The London-based Spotware has developed cTrader as a competitive trading platform with MT5. It does not provide as many indicators and services as the latter, but it does also support spread betting (which has nothing to do with forex trading, but which some traders like). As for online apps, there is a wide variety available, at least two hundred on Android alone – and MT5 is also available in app form. If trading from your smartphone is your priority, then pick your broker first. The broker will probably offer a proprietary online trading app, and you’ll want to use that one. The trader makes use of the tools that best complement the preferred forex trading strategy. For example, traders who use an approach based on technical trends – meaning that they analyze the movement of prices on charts – can customize the kind of charts and indications they require. Forex Traders who work with trend analysis indicators like stochastics can find a vast selection to choose from. Traders who base their decisions on fundamental analysis, meaning they watch for news events or economic trends, can find news and often lists of relevant economic announcements on the platform as well. So how do you make a trade? Your account is in a specific currency – you may also have a multi-currency account, in which case you select the currency you wish to trade with. You then select the currency you want to trade into, and for how much. If I have $10,000 in my account, and I want to buy JPY 5000, then the platform will set up the purchase, allow you to put in the stop-loss position and take-profit one as well, and then wait for you to give the confirm click that starts the trading. Remember: Once you confirm the trade, you can’t do anything to affect what happens until you click the ‘Stop’ button – so set the stop-loss and take-profit carefully! All of these forex trading platforms are free, but usually, you are best off downloading it from the website of the broker you choose – the forex broker may offer special tweaks and services.